If you’re looking for ways to raise funds for Charity, a charity fun casino fundraiser could be just the thing you’re looking for. A charity fun casino draws in a wide range of people, young and old, male and female. Its wide reaching appeal is thanks to the fact that a casino has an air of elegance and sophistication attached to it which stems from old Bond movies like Casino Royal and Diamonds are Forever. Even in modern Hollywood, casino games are prevalent; including movies like Ocean’s Eleven, Casino, The Sting and Fear and Loathing in Las Vegas. 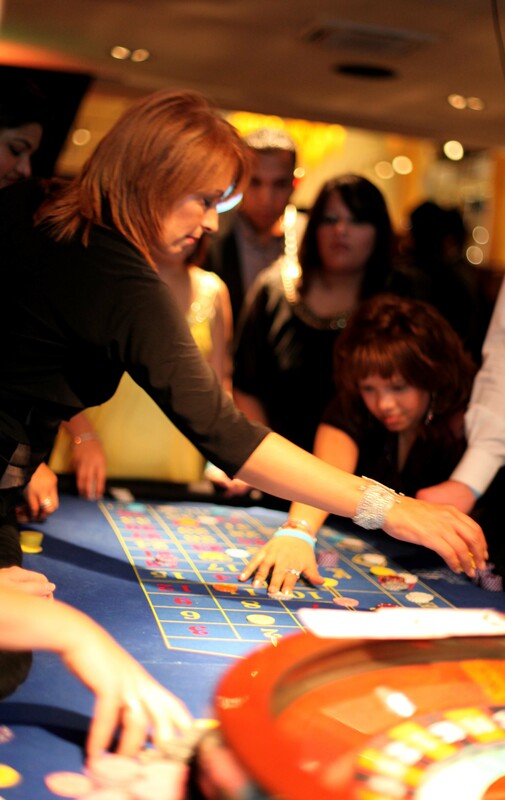 For so many different reasons, a Casino is the epitome of ‘cool’, so it’s a great way to get people through the door for your charity fund raising event. How Does a Charity Fun Casino Work? Normally a fun casino is booked and paid for by the host, and guests are treated to free fun money to play on full size, authentic looking casino tables. At the end of the night, the person with the most money wins a prize, usually a bottle of Champagne or a certificate. All the games are just for fun. No real money changes hands, and it’s a great way to entertain guests and drum up an exciting atmosphere at your event. A charity fund raising fun casino is slightly different. Instead of guests receiving free fun money on the night, they are encouraged to pay for the fun money to raise funds for the named cause. This way, no real money changes hands on the casino tables, but the charity of choice receives a donation each time someone wishes to play. The great thing about this is that most players lose their money on the Roulette table when they make brave bets, and lots of players like to make brave bets, therefore, they’ll be likely to come back again and again to buy more fun money with which to play with! A fun casino event is such a fun night and you’ll find that all of your guests will really want to play and raise money for the charity. There are different ways we can raise money, so if you’d like to find out more, please call us today for a chat.